An aimless life is practically no life. A man without aim is like a ship without a rudder or an engine without steam. His ambition puts him into action. We must therefore have some definite aim in life that is we must choose a profession. One who chooses no profession passes an unhappy life. The right choice of a profession is very necessary. Right choice is the key to success of life. The question of choosing a profession was not very serious in the past. The son generally followed the profession of his father. It is not possible now. Times have changed. Talents and tastes differ. Every profession cannot suit everyone. So while choosing a profession we should keep in mind the natural taste, physical fitness, opinion and guidance of teachers, elders and parents, economic condition of the family and the future prospects in the profession. Everyone no matter how rich or poor, old or young, intelligent or dull, dreams of a rich future life. Some wish to become leaders, some desire to achieve power over nature and some dream of high position. Keeping in mind the factors for right choice. 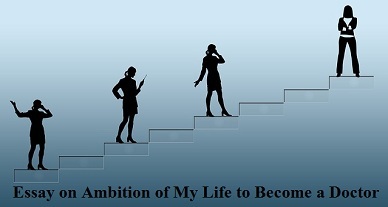 I too, have my own ambition. I wish to be a doctor. My choice is according to my taste and talent. My family traditions also go in favor of my choice. In this profession there is a great field for service. The doctor is second to none for sick person. Secondly this profession is an independent one. A doctor gives his time, energy and skill in curing the sick. From the very beginning I dreamed to serve the poor people of my town. This profession of my liking will give me enough chance for service. I want to be an ideal doctor. Some doctors care more for their gain and less for their patients. They dream of a bungalow, a car and other luxuries of life. I will keep away all such things from my mind. I shall not serve any hospital but will start a dispensary of my own. Kindness will be my motto. I shall give free medicine to the patients who are poor and needy. My aim will be a speedy recovery of my patients. It is neither for money nor for high position that I wish to become a doctor. It is something nobler than these. It is my wish to serve my fellow beings. I am sure of success as a doctor. Sincerity and devotion will be my guiding factors. May God fulfill my aspirations.